Another clear, frosty night here on the South Coast of England. The seeing conditions were quite stable again and I took these 3 images of the Great Red Spot and also ‘Red Spot Jr’ crossing the disc. This one is the middle of the 3 images, all three are available via the thumbnails below. 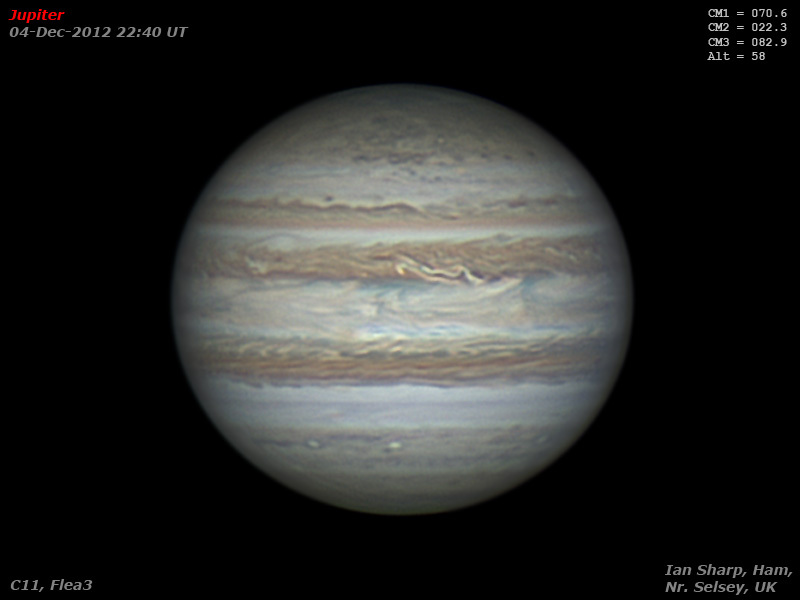 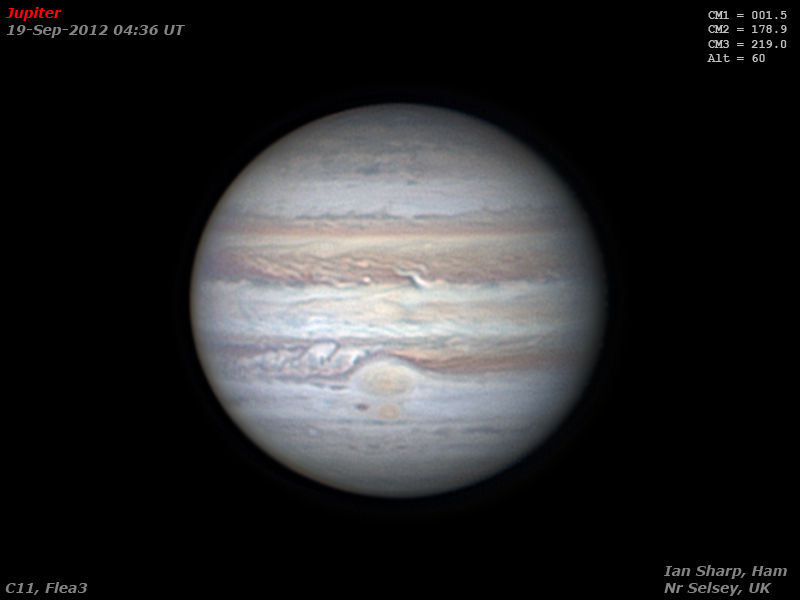 Jupiter, Planets Comments Off on Jupiter – A case of the blues! There’s a moral here somewhere.I went out this morning under a crystal clear sky; Jupiter blazing away in the South-East. 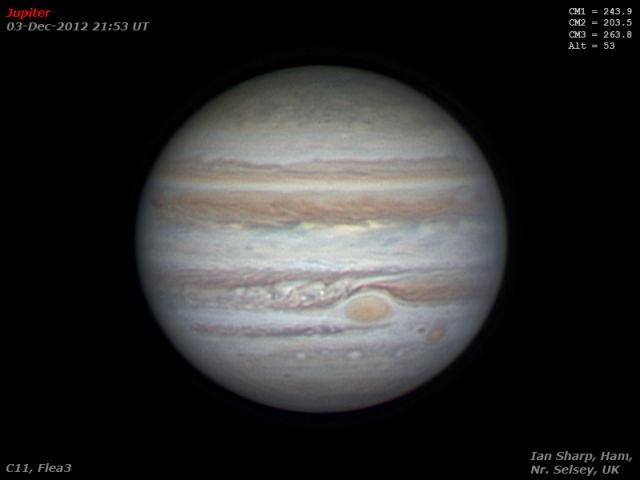 With collimation complete and a quick butchers through the eyepiece, I got the planet squarely on the chip of the Flea3. 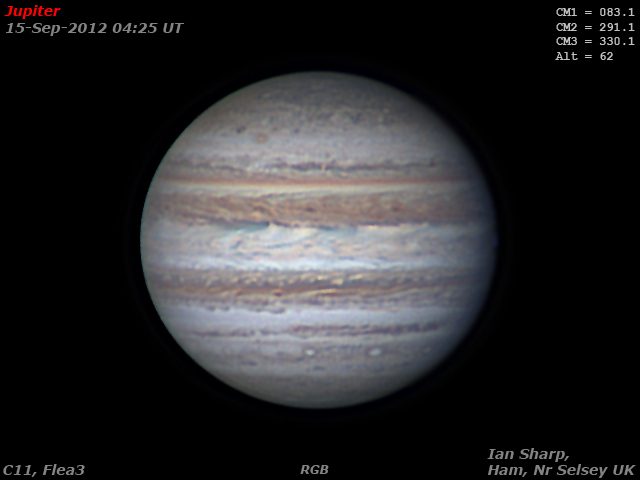 Just finishing the run of green images when clouds rolled in, so I too about 500 frames of a very dim blue. 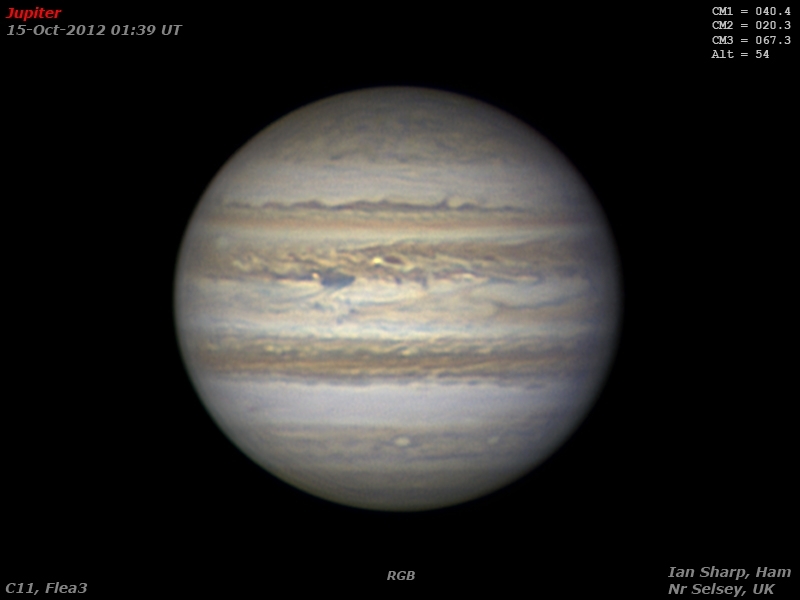 Anyway, no more clear sky (until later when I got clouded out before any images could be captured), I decided to process the blue and hey-presto a decent RGB image! 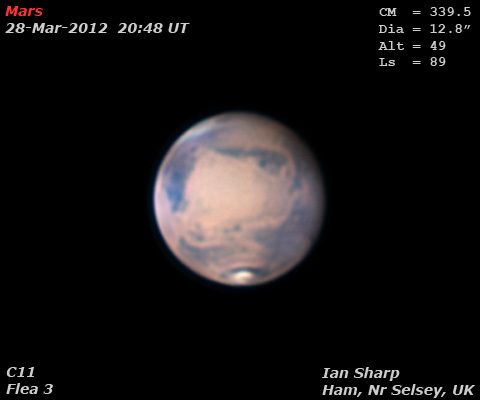 Last night’s Mars image, shown here, illustrates the effect of ‘seeing’ conditions. 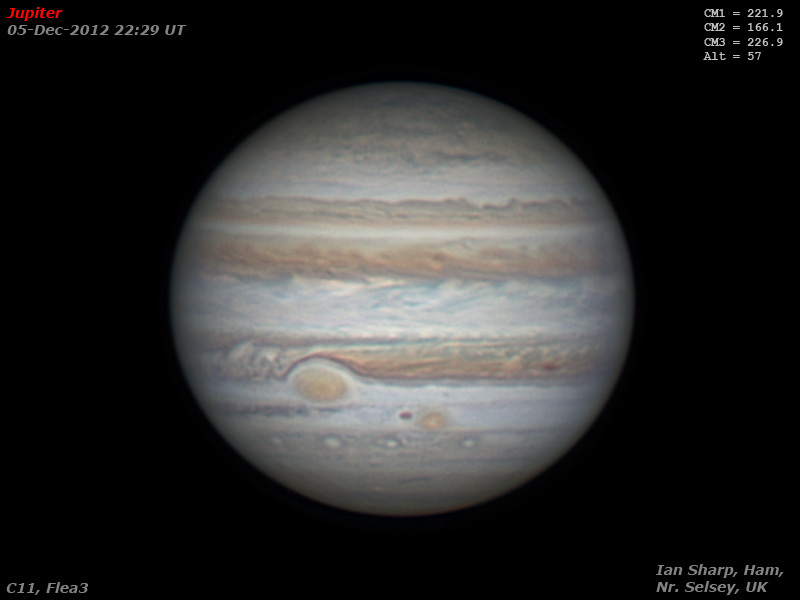 The seeing was fairly good and stable last night – compare this image to the post, here, from the previous night when the seeing conditions were not so good. Another Mars image taken last night from here in Ham. The biggest and most obvious dark region called Syrtis Major is visible on the left in this image. It’s interesting that the Martian ‘day’ is about 24 hours and 40 minutes (in other words the time Mars takes to rotate once on its axis). 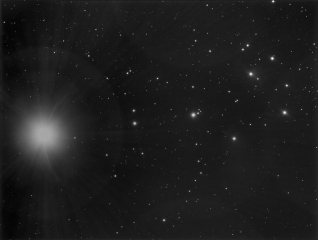 This means that, for Earth-bound observers, we only see about 40 minutes of ‘new’ territory each night if we observe at the same time. 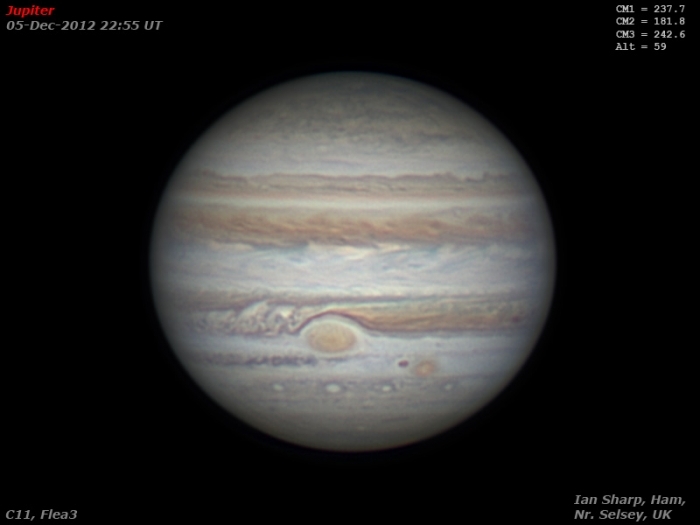 So, Syrtis Major will slowly crawl into full view over the next few days (for UK observers at least). A nice view also of the snake-like feature called Sinus Sabaeus with the ‘head’ part called Sinus Meridiani. 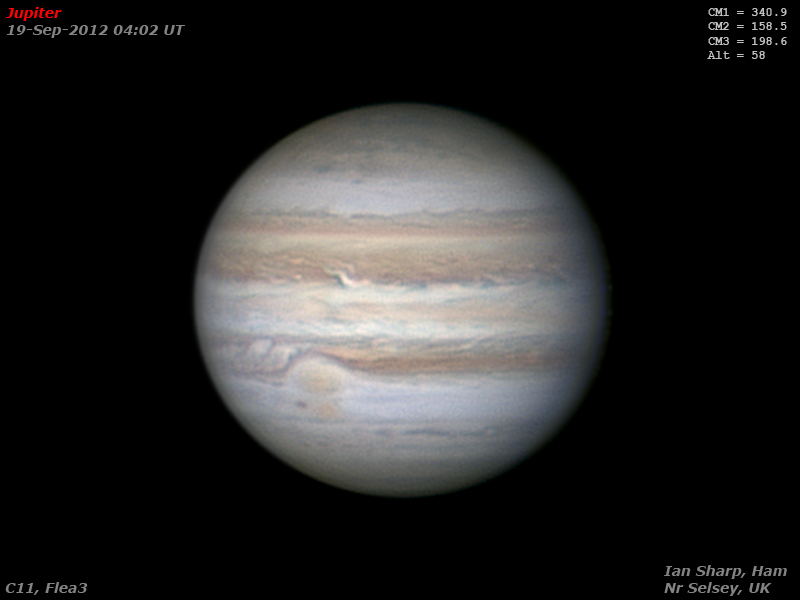 The seeing conditions were pretty jittery last night, so again this image is quite soft on detail. 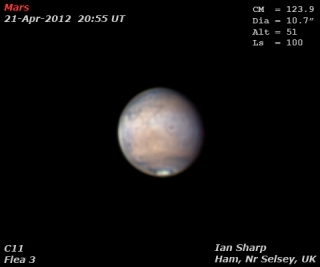 Not so many clouds visible either.